To be successful homeschoolers, we need to embrace all the different aspects of our child. A big aspect that needs a lot of attention is incorporating their physical bodies into their learning. Each child will have different needs when it comes to physical movement, but they all have needs. Here are some ideas from our team on keeping our active kids learning with movement. We use movement a lot. One of our recent math lessons had my little guy running around the table to different “stations” to solve addition problems from his worksheet with different manipulatives. I used a stopwatch to encourage him to move quickly. We’ve also hidden words around the room to find and then read or spell. One of my favorite products to have on hand has been Ultimate Brain Breaks (by Heather Haupt). When my kids get restless, I have them choose one or two brain break idea cards. It only takes us a couple of minutes and really helps with both focus and motivation. Five minute breaks to beat the punching bag, jump on the trampoline, scooter around the block, or dance to a favorite tune will also do wonders, particularly for my older kids. I have some very active boys and one that has a lot of sensory needs, so we use physical activity a lot in our homeschool. We take lots of breaks to do sensory input that he needs. When it is warm outside, we try to do a lot of our learning outdoors, but we also have indoor swings that we use when the weather is too cold to spend too much time outside. We also try to do yoga for body awareness everyday. Whenever I can set up math or reading in a way that incorporates movement, we do it! From doing addition problems using jumping jacks or racing between sight words, he definitely learns best when he is moving! I think the most important thing is to know what your child needs and when he usually needs it. My son is best at sitting still for things in the morning and needs a lot of movement in the afternoons, so we schedule our homeschooling accordingly. Some think the classical tradition produces only “bookish” children, but a classical education has always emphasized both gymnastics for the body and music for the soul. We help our children with special needs exercise, grow strong, and gain self-control over their bodies for poise, grace, and service to others. Daily movement, walks in fresh air, swimming, or brief bursts of soccer and other ball games can ease anxiety, promote calm, and refresh for further study. We take breaks in our school day. Sometimes it’s an outside bubble break or some time to swing in our backyard. I can tell when we need movement; that’s usually when things start to derail. Playing a ring-toss game to review a subject or jumping or dancing during learning a song all help my kiddos to learn. I would walk around the house with my son sitting on my shoulders while I asked him rhyming words, words that include letter blends, words that matched definitions, etc. Obviously, I was asking the questions as I thought of them because my hands were not free to look at anything. In a similar fashion, I would hold him like a wheelbarrow while asking questions, too. I created “stepping stones” with letters on them for my son to step on when spelling words or practicing phonics. I spread them around the living room so he had to look for the correct one, and they were not near each other. When he was younger we would play Twister sometimes as part of a break from learning. I incorporated nature walks as much as I could, and we would talk about anything we saw around us. Along with some other homeschoolers, we would tag along with a Montessori teacher on Fridays to nature preserves, beaches, and state parks around the area. Sometimes we attended naturalist talks as part of those trips. A co-op here meets once per month at a local park to participate in cooperative games led by a Waldorf teacher. There is also a parent who organizes “Nerf Wars” at a local park periodically. We have participated in a parent and child bowling league in the past. I count walking our dog as P.E. There are several orchards within driving distance where we can go to pick fruit, which is good for reinforcing science as well as counting for P.E. I hope to arrange some tours and conversations with farmers in the future as career exploration in agriculture, too. Laser tag is another thing I hope to organize with some other homeschoolers. In general, movement is needed to help our body be able to learn and process information. It also helps keep our kids motivated. I have always incorporated learning breaks every 15-25 minutes, especially if we are not moving as part of our activity. Jumping jacks, crab walk, walking on a curb as it if is a balance beam, jumping from one hula hoop to another placed on the ground in a row—these are all things that can be done in a few minutes and be beneficial. My son and I have played Red Light-Green Light and Simon Says as well. My little boys have so much energy, and Mama doesn’t have as much as she used to. So when they need to run and play, they go outside pretty much until they are worn out. We utilize a trampoline which is great for one child in particular, as whole body stimulation relaxes him. We also have two of those $14 Walmart plastic pools on our covered porch that stay filled year round since my kids enjoy water play so much. At 8 & 4 they are through with school so quickly. I’m grateful that my children have so much safe space to run and play. In addition to these, my older children have enjoyed Tae-Kwon-Do and dancing classes. It is hard to remember back to those days when my kids wouldn’t sit still. Now as young adults and a teen I find I have to work extra hard to get them moving, but I digress. When my boys were younger we lived in MN, so for about 6 months out of the year we either bundled up and went outside or were creative about purchasing annual memberships to places that had HUGE indoor spaces. Fortunately we lived within a mile of the MN Zoo, so we made sure to plan school around a trip every week. We also taught the kids how to ski, went sledding at the local “hill,” and employed them as shoveling helpers. Other active indoor activities my kids loved were fort building, historical reenactments backdrops, and relay race courses using every piece of furniture they could scramble over and under to increase the difficulty. Usually I would allow these “creations” to stay a day or two, and as much as I could I would incorporate our learning activities inside them or alongside them. As our kids moved into their teen years we moved to the country, so chores in taking care of animals became a huge part of our lives as well as their school. My children learned so many things living in the country, some which they remember with fondness and others not so much; but those activities have made a lasting impact on their work ethic and how much they appreciate the simple things that life has to offer. As I look back, I do recall how much extra work it was to make learning active, but I am so glad that I didn’t allow myself to stick to just books and computers for instruction. My kids would never tell you about how great their math lessons were when they were in 5th grade; but they will tell you with vivid descriptions the entire day and night they spent under the dining room table eating, sleeping, reading, studying, and talking about cold Russian winters while simulating the long sleigh ride of Catherine the Great from Poland to meet her future husband. 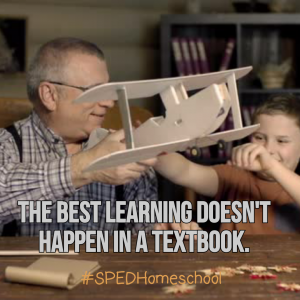 As you can see, we love to get moving in our homeschools! 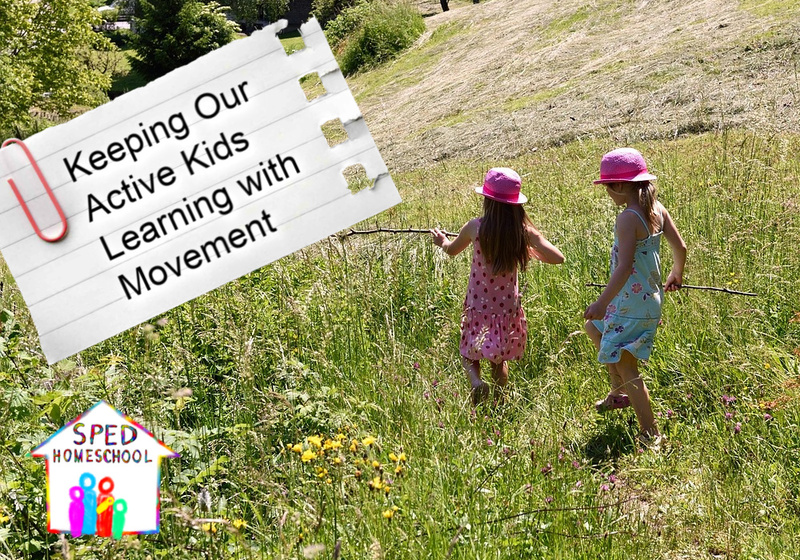 Whether by including movement breaks or creative activities, learning with movement is a key part in keeping our active kids engaged and motivated. Try some some of these ideas to get your kiddos moving or check out our Pinterest boards for more ideas.